This week’s edition is dedicated to the work of high school students from public schools across West Michigan, who attended SNN’s inaugural journalism camp in July, thanks to a grant from Gannett Foundation. Omelettes and Pizzas and Onions, Oh My! Given that she has eight brothers and three sisters, Mileaha “Mylee” Shupe says cooking is already a major part her life. Nevertheless, the 12-year-old got a taste recently of what it would be like to become a chef. One of the first things Mylee and her campmates at Kent ISD’s culinary camp did was meet Harry, the name instructor Ryan Marklevitz gives the top of an onion. When it comes to that particular acidic vegetable, however, Mylee isn’t biting. “I don’t eat onions” she said. “How many times do we cut through Harry?” Marklevitz asked campers. 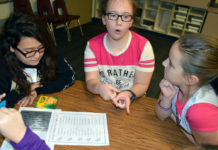 Kent ISD hosts several annual summer camps including Ultimate Gearhead, where campers learned about fixing cars, and Cops and Robbers, which taught how to fingerprint and handcuff those on the wrong side of the law. This year’s camps took place July 11-14. Mylee and her campmates were first assigned the task of making an omelette using ingredients such as milk, sour cream, tomatoes, onions and their own recipe of seasonings. After their final product was finished, Mylee and her partner, Kelsey Tedford, were ready to have their creation put to the test. Each group’s omelette was rated on taste or presentation. Mylee also made a pizza during camp, with partners Casey Ballor and Amelia West. She used a rolling pin, a mixer and a contraption that put holes in the dough, or, as Luke referred to it, “the torture device,” a tool used to prevent bubbles from forming and displacing toppings. Mylee’s group had to experiment with different amounts of dough ingredients when they first added too much oil and then too much flour. A disputed technique among campers was whether to pinch or roll the rim of the pizza, and Mylee’s group settled on doing both. Mylee said that she learned about different styles of cooking and utensils she hadn’t heard of before. She said she gave the camp a 9 out of 10, falling short of perfection because, she said, there was so much to do in so little time. Austin Sietsema rushed around and searched the kitchen. “Oh, my onion! I need my onion!” the middle-schooler said as he pointed his finger toward the ceiling as if he were having an ‘aha’ moment. 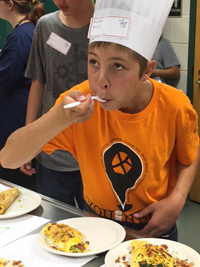 It was a hectic but fun day recently at the young chefs camp at Kent Career Tech Center. The camp was one of a half dozen the tech center offered, including baking cupcakes and repairing automobile engines. 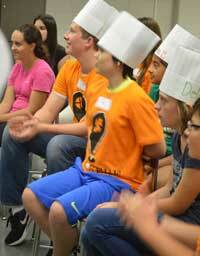 Every student wore a white chefs hat that they customized with their names written in bright colors. Whether it was throwing flour around, kneading pizza dough, or chopping up onions for salsa, everybody seemed to be having a good time. “I love cooking because I can put different substances together and see what comes out of it… then I get to eat it,” camper Alexander Kempston said. Constant chatter and laughter mixed with pots and pans clanging and clashing, filling the humid air. One group of campers washed and dried utensils as another put their final touches on their omelettes. At a signal from Marklevitz, they flocked to the omelettes with forks and watering mouths. The homemade masterpieces were lined up, some rated on presentation and some rated on taste. Some were sprinkled with fresh vegetables and herbs, and even topped with sauces the young chefs invented themselves. “Dude, you need to try this one!” Kaden Woods said. Marklevitz, with help of cook Pete Gonzales, teaches the aspiring chefs how to do it like the pros. While at camp, students learn kitchen safety, cooking terms and how to work as a team, put together a menu and prepare gourmet meals. Marklevitz says his goal is to show kids how to be safe and smart in the kitchen. He even took time to sit the kids down and demonstrate how to properly and safely use knives. Evan Hebreard contemplated his onion, tousling the dried golden strands of shredded skin.”It kinda looks like Justin Timberlake when he had that ramen hair,” he said. On the quick command of Chef Ryan Marklevitz, Evan and his middle school campmates quickly surrounded the stainless steel tables, peering over and around one another in tall white chef hats. An excited buzz filled the kitchen. 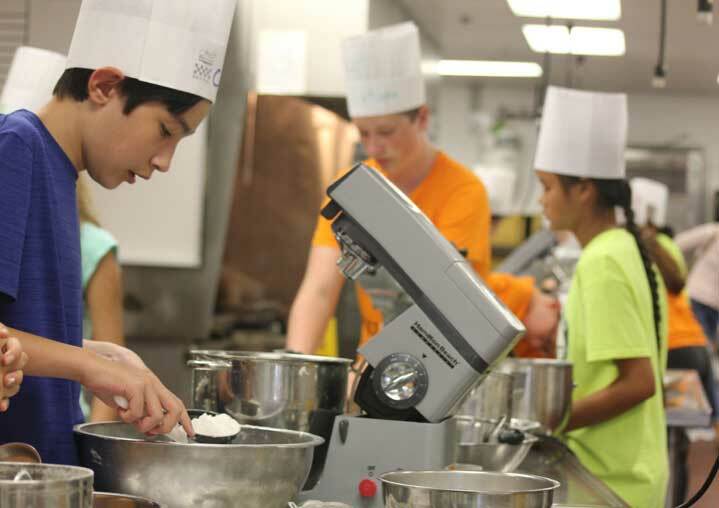 The potential future chefs, each holding their own onion, attended a four-day young chefs camp offered by Kent Career Tech Center and got a jump start recently on the “Iron Chef” experience working in a professional-grade kitchen. 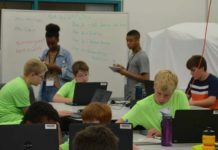 The camp was part of a handful of experiences that allowed middle-schoolers to pursue their passions courtesy of skilled, experienced instructors, including how to fix cars, make pastries, lift fingerprints, take pictures and construct a solar-powered car. In the young chefs cooking camp, students were taught how to prep the kitchen, cooking terms, menu and meal preparation and team and social skills. 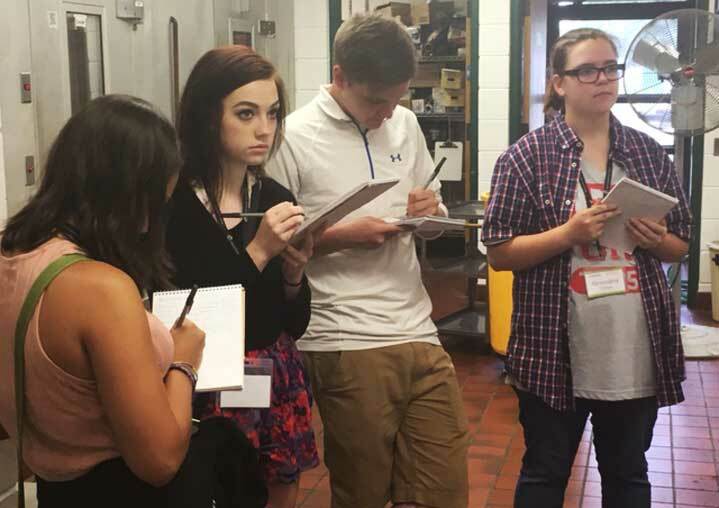 For those who find their future leaning toward culinary arts, the camp served as a good way to learn about programs offered to high school students at the Tech Center. Marklevitz said those who complete the two-year program, which they can attend during high school, “leave with a quarter of college paid for” because credit earned at the tech center goes toward college credits in those fields. Evan and his middle school peers used their new skills to make salsa, starting with the chopping of the previously mentioned onions. Marklevitz quizzed campers on the steps involved as students piped up with answers. Cleaning, cooking, tasting and comparing were a big part of each day. At the end of a messy process, the camper-cooks compared their work, forks at the ready, then rated one another’s omelets on taste and appearance. Grace Lawrence waved her hands in front of her bulging, watering eyes “Hot! Spicy omelet!” she said in a high-pitched voice. “Dude. Ours taste so good,” said Evan to a friend. Through this experience middle school students are able to take a closer look at their culinary passion and get some practice in a professional grade kitchen. “It’s kinda like we’re the next Gordon Ramsay,” Evan said. Middle School Locker Room or Masterchef Jr.? Loud bangs and crashes fly throughout the commercial-grade kitchen as a group of middle school culinary campers rush to finish in time. Laughs rumble out, shaking the students’ handmade chef hats that bear their handwritten cook names like “Chef Ketchup.” With the dishes washed and the kitchen somewhat cleaned, it’s now time for the presentations. Students gather around a steel table, omelettes arrayed as instructor Ryan Marklevitz explains the grading process of rating one another’s plates on taste and appearance, on a scale of 1 to 6. Kent Career Tech Center is a program of Kent ISD that is open to high school students in Kent County. Many offer college credit for completion during student’s time at Tech Center programs. Campers were taught various basics such as knife safety, how to properly wash dishes, sanitation and how to make foods such as salsa, omelettes, Mexican, Italian, desserts and a last-day challenge. The youngsters didn’t appear to take camp too seriously. The kitchen could have been compared to a locker room: boisterous, muggy and almost fluently chaotic. Middle-schoolers worked diligently, yet theatrically. Restless voices and hands flashed everywhere. The scene in the kitchen was frantic, but the cooks hustling and bustling to get their food out weren’t at a local restaurant, but inside a school. During the summer. By choice. A group of middle-schoolers recently spent hours rolling dough, frying eggs and learning proper techniques of slicing and cutting food. They came to learn how to cook, and for some, how to become better cooks. 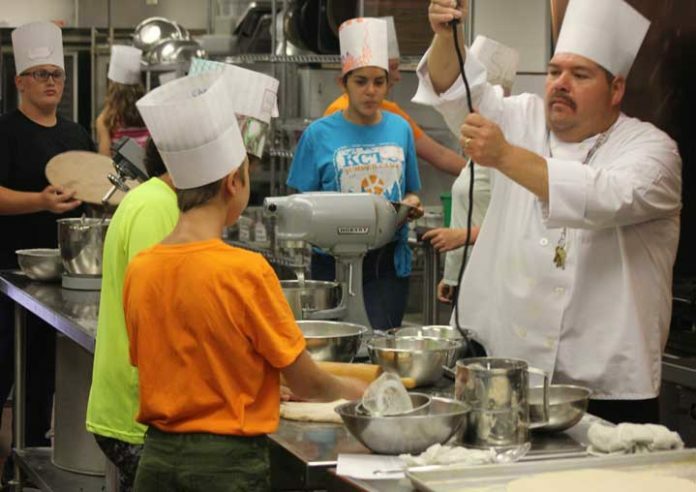 For the second year in a row, Kent Career Tech Center hosted a young chefs camp for middle school students around Kent County. Instructor Ryan Marklevitz leads the charge, giving the students a crash course in skills needed to be successful chefs. It is not only his experience in culinary arts that help the kids, but also his passion for education. He said the most important thing is that the students enjoy themselves. Day one was all about learning safety and cleanliness in the kitchen, and on day two, the kids got right down to cooking omelettes. 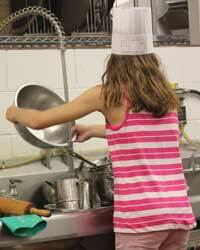 Aspiring chefs were not the only students who flocking to the Tech Center this summer for camps. Others included criminal justice, auto maintenance and baking. 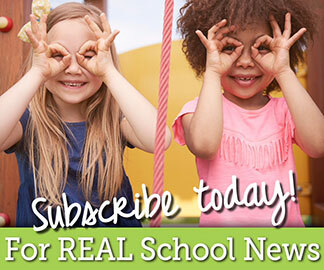 What drew kids to young chefs? For at least one of them, the choice was easy. “I want to cook food that I like,” said seventh-grader Lucas Christensen. Although the majority of cooks and chefs are male, Marklevitz said, the tech center’s summer camp had a near equal mix of boys and girls. Whether everyone was there because of their appetite for cooking was debatable, but their love for food was not. “Let’s get back to eating some of these things,” Austin Sietsma said. Plates slammed towards each other, and silverware scraped against them as a group of about two dozen middle school culinarystudents rushed to clean up or finish decorating omelettes they had created. “Ten minutes left!” Ryan Marklevitz said. “It feels like we’re on a cooking show,” said eighth-grader Kelsey Tedford. It was Kelsey’s second year through the hospitality camp at Kent Career Technical Center. She said she even was using some of the techniques she had learned last year on the assignments she was working on this year. She said she chose hospitality because she really enjoys cooking and baking, and because she wanted to see what it was like to work in a kitchen. She found it was worth it; and enjoyed making the salsa over the omelette because with the salsa she actually got to put it together and could taste it while making it. With the omelette she only was able to make the egg but not add any vegetables or anything inside. “Cherry, cherry this one is a four.” Austin Sietsema, a ninth-grader, said. He called his friend Conor “cherry” for a bonding game. They had to come up with a food name that had started with the first letter of their first name. Austin was known as “apricot”, and their other partner Logan was “lasagna.” When asked if they all enjoyed teamwork they had responded with a yes. When Austin was asked if he had chosen hospitality, his response was that he almost chose sweet genius, another camp that was all about baking. He decided to go to this camp because he wanted to also learn how to cook so he realized that he got the best of both worlds. “I want to be able to make as good of a homemade key lime pie as my grandmother.” Austin said. Chef Ryan Marklevitz a retired navy member that used to cook on a submarine, now a culinary teacher. He went to Grand Rapids Community College for an associates degree in culinary arts, then went on to Ferris State University for a teaching degree, and finally on to Central Michigan University in educational technology. “Just have fun,” said Marklevitz when asked what he would tell students who were interested in going to culinary arts.